Sensitivity Analysis in Earth Observation Modeling highlights the state-of-the-art in ongoing research investigations and new applications of sensitivity analysis in earth observation modeling. In this framework, original works concerned with the development or exploitation of diverse methods applied to different types of earth observation data or earth observation-based modeling approaches are included. An overview of sensitivity analysis methods and principles is provided first, followed by examples of applications and case studies of different sensitivity/uncertainty analysis implementation methods, covering the full spectrum of sensitivity analysis techniques, including operational products. Finally, the book outlines challenges and future prospects for implementation in earth observation modeling. 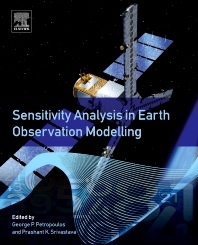 Information provided in this book is of practical value to readers looking to understand the principles of sensitivity analysis in earth observation modeling, the level of scientific maturity in the field, and where the main limitations or challenges are in terms of improving our ability to implement such approaches in a wide range of applications. Readers will also be informed on the implementation of sensitivity/uncertainty analysis on operational products available at present, on global and continental scales. All of this information is vital in the selection process of the most appropriate sensitivity analysis method to implement. 2. A World of Models – How Can They Be Classified? 8. What Did We Learn?